Many Native IDs Won't Be Accepted At North Dakota Polling Places The Supreme Court has upheld a state law requiring voters' IDs to have street addresses, which many reservations do not use. Native American groups are now scrambling to prepare for Election Day. 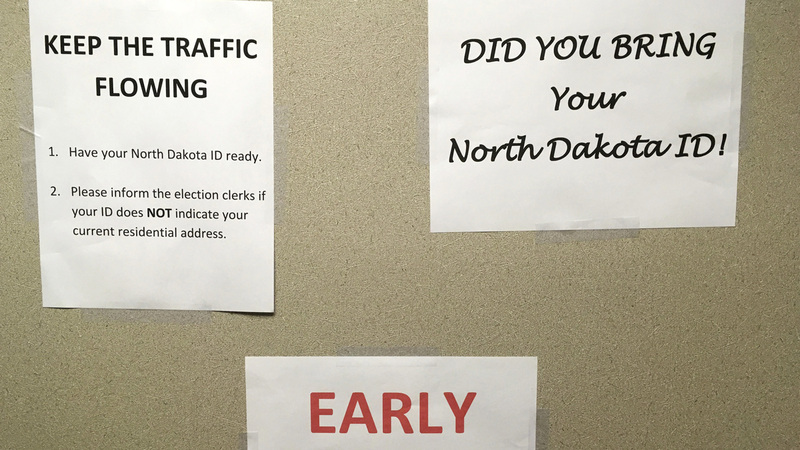 This June, instructions were posted at an early voting precinct in Bismarck, N.D. In that primary election, tribal IDs that did not show residential addresses were accepted as voter ID. But those same IDs will not be accepted in the general election. Those IDs used to be accepted at polling places — including in this year's primary election — but will not be valid for the general election. And that decision became final less than a month before Election Day, after years of confusing court battles and alterations to the requirements. And in North Dakota, every resident is eligible to vote without advance voter registration — so people might not discover the problem until they show up to cast their ballot. The Republican-controlled state government says the voter ID requirement is necessary to connect voters with the correct ballot and to prevent non-North Dakotans from signing up for North Dakota P.O. boxes and traveling to the state to vote fraudulently. In 2016, a judge overturning the law noted that voter fraud in North Dakota is "virtually non-existent." The state government says that residents without a street ID should contact their county's 911 coordinator to sign up for a free street address and request a letter confirming that address. Jamie Azure, the tribal chairman of the Turtle Mountain Band of Chippewa Indians, says his tribe has been preparing for this shift ever since the law was first passed years ago — but with the final decision coming just weeks before Election Day, "the timing is horrible," he tells NPR. "It's just a daunting process." The ID requirement change doesn't just affect the state and federal elections — it's also affecting Turtle Mountain's tribal elections, because the tribe follows state and federal voting requirements. Azure's tribe is offering free tribal ID days, when residents can get updated IDs with residential addresses at no charge. "We're trying to tear down the barriers on our side, at the cost of the tribe," he says. "Native Americans can live on the reservations without an address. They're living in accordance with the law and treaties, but now all of a sudden they can't vote," Standing Rock chairman Mike Faith said in a statement. "Our voices should be heard, and they should be heard fairly at the polls just like all other Americans." "Bret Healy, a consultant for Four Directions, which is led by members of South Dakota's Rosebud Sioux Tribe, said the organization believes it has a common-sense solution. "The group is working with tribal leaders in North Dakota to have a tribal government official available at every polling place on reservations to issue a tribal voting letter that includes the eligible voter's name, date of birth and residential address." OJ Semans, the co-executive director of Four Directions, says the group will be "hard-pressed" to get that proof for every eligible voter in the short window of time that's available, "but that doesn't mean we're not going to try." Semans, a member of the Rosebud Sioux Tribe/Sicangu Oyate, says that if North Dakota really wanted to help Native Americans vote under the new requirements, it would let the tribes access the 911 numbers in bulk, instead of requiring every individual to do it. "They figure, 'If we go one by one, people aren't going to want to do it, we can drop a few thousand [voters] off just by saying in order for you to vote, you have to call us, go through the hassle,' " Semans tells NPR. Heitkamp called the ID law "burdensome" and once again called for a law to protect the voting rights of Native Americans. She and other legislators have introduced such a bill year after year, unsuccessfully. "Given the number of Native Americans who have served, fought, and died for this country, it is appalling that some people would still try and erect barriers to suppress their ability to vote," Heitkamp said in a statement. "Native Americans served in the military before they were even allowed to vote, and they continue to serve at the highest rate of any population in this country." The American Civil Liberties Union said the Supreme Court's decision "enables mass disenfranchisement." "In an election that may wind up being decided by just a few thousand votes, the court's decision could be deeply consequential for the country, not just those who live in North Dakota," ACLU staff reporter Ashoka Mukpo wrote on Friday. In 2016, the Harvard Law Review found that Native Americans "routinely face hurdles in exercising the right to vote and securing representation" and that the Voting Rights Act of 1965 was only a partial solution to the problem. Meanwhile Azure, of the Turtle Mountain Band, says that the North Dakota law might have an unintended effect. "We are members of this U.S. government, and we are not going to let you keep us down. We're going to figure out a way to to go over the barriers that are put in front of us. ... And this unified movement moving forward with the tribes? That's going to jump our percentages up, with that Native vote."